When DTM postdoctoral fellow Myriam Telus did a research assistantship in isotope geochemistry during her undergrad at the University of Chicago, her supervisor was studying meteorites, those extraterrestrial rocks that survived impact on the Earth's surface. Meteorites provide endless possibilities for cosmochemists to address fundamental questions about solar system formation. When and how did the solar system form? What was the raw material that went into forming the solar system? Where did this material come from? How was this material distributed in the solar system? What were the building blocks of planets like? 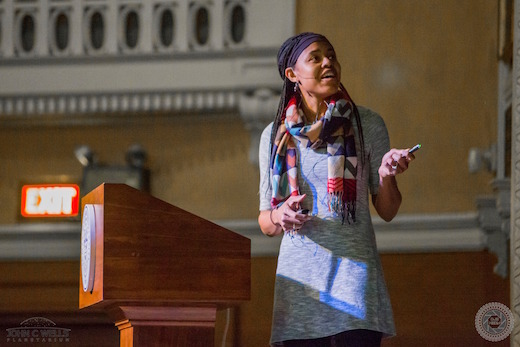 It was during that assistantship that Telus discovered her passion for cosmochemistry. Today, Telus can be found in the lab studying the conditions under which carbonates, the main minerals in limestone that form as a result of water-rock interactions, formed on asteroids. We asked Telus how she first became interested in cosmochemisty, and what she will be doing at her next job as a tenure-track faculty member in the Earth and Planetary Science Department at the University of California Santa Cruz. Myriam Telus, a postdoctoral fellow at DTM, in the Keck Cosmochemistry lab at the University of Hawaii at Manoa, where Telus did her Ph.D.
DTM: When did you first become interested in your field of research? Myriam Telus: I did an undergraduate research assistantship of some sort in isotope geochemistry at the University of Chicago. My supervisor also studied meteorites, which is how I first learned about them and about cosmochemistry. Meteorites are extraterrestrial rocks that survive impact on the Earth’s surface. Most are pieces of asteroids, debris left over from the birth of the solar system that did not go into forming large bodies like the Sun or planets. They give us an idea of what the building blocks of planets, or planetesimals, were like. While a doctoral student at the University of Hawaii - Mānoa, I became especially interested in chondrites, meteorites from asteroids that did not get hot enough to melt. They provide the most pristine record of the protoplanetary disk, the cocoon of dust and gas surrounding the early Sun where the planets formed. Chondrites contain the oldest objects in the solar system! I’m fascinated by the complexity of these rocks. Many aspects of their formation are still debated, such as when and how did the different components form, mix together, and eventually form asteroids. At the Lunar and Planetary Science Conference and the Meteoritical Society Conference, there are often vibrant debates about when and how chondrites and their components formed and this is what initially attracted me to this particular area of cosmochemistry. I’ve seen people slip and fall rushing to get to the microphone to ask their question or state a rebuttal to a controversial idea. The passion researchers in cosmochemistry have for their work was contagious in my case. Telus giving a talk at James Madison University about meteorites and the origin of the solar system. DTM: What brought you to Carnegie? Telus: For my Ph.D., I focused on trying to better understand when chondrites formed. I worked on developing the 60Fe-60Ni short-lived radionuclide system as a chronometer by trying to constrain the initial abundance of 60Fe in the solar system. In the process of that work, I became interested in also studying how chondrites formed. I wanted to understand the role of ice and water in chondrite formation and evolution. I wasn’t sure exactly how to go about this, but I knew Conel Alexander does a lot of work in this area, and I thought it would be great to work with him. Also, I knew that Carnegie would be a great place to do a postdoc. I had the deadline for the postdoc fellowship in my Google calendar long before I was even ready to apply. Larry Nittler invited me to give a talk a few years ago. I enjoyed my visit to the campus and was impressed by the many resources available to postdocs here. Former postdocs always have great things to say about DTM. Christian Miller, who is now at the University of Hawaii where I did my Ph.D., loves talking about his time at Carnegie. He gave me helpful advice about how to apply for the fellowship. Nick Moskovitz also expressed to me how much he enjoyed his time here. Even people who aren’t alumni recommend DTM. It is well known in the cosmochemistry community as a great place for postdocs to thrive in their research and it’s been exactly that for me. This carbonaceous chondrite sample is only 1 inch across, but it contains pieces of objects that formed throughout the solar system. DTM: What research project are you working on now at DTM? Telus: Right now, I am studying the conditions under which carbonates formed on asteroids using the NanoSIMS 50L to measure the C and O isotopic composition of calcium carbonates in chondrites. Calcium carbonates are the main minerals in limestone. They form as a result of water-rock interactions. Carbonates in chondrites provide a great way to track changes in the composition and temperature of fluid on asteroids over time. I have only analyzed two samples so far, but I already have some interesting results that indicate different generations of calcite (CaCO3) grains formed as a result of a transient hydrothermal event on the asteroid. 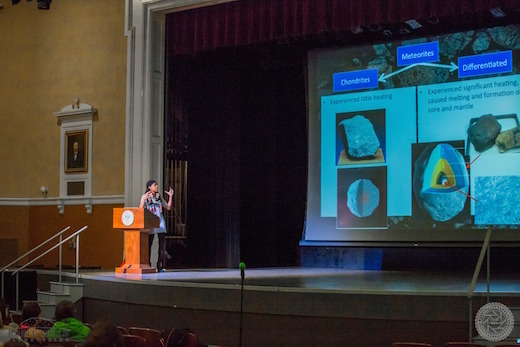 I recently presented my preliminary results at the Meteoritical Society Conference. I will spend the rest of this year analyzing a couple more samples for C and O isotopes. Then, I plan to constrain the relative ages of the carbonates and the timing of the related hydrothermal events using the 53Mn-53Cr short-lived radiochronometer. Ultimately, I will use this data to place constraints on the composition and temperature of the fluid, and the nature of fluid flow on early planetesimals. 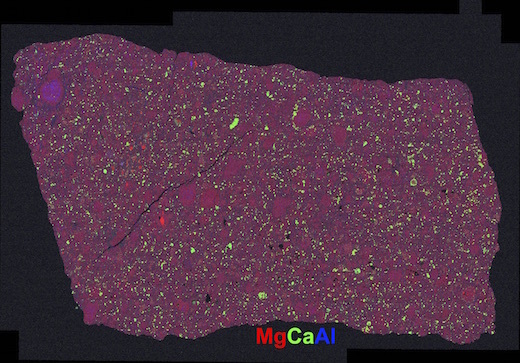 Here is an elemental map of a carbonaceous chondrite. Telus uses these images to identify carbonates, which show up in this image as green, for her isotopic analyses. Telus: I’m excited about the endless possibilities meteorites offer me to do interesting research that address fundamental questions about many different aspects of solar system formation. When and how did the solar system form? What was the raw material that went into forming the solar system? Where did this material come from? How was this material distributed in the solar system? What were the building blocks of planets like? I spend a great deal of my time characterizing meteorites with different types of microscopes and preparing the samples for isotope analyses. When you look at a chondrite with a microscope, you’re looking at things that came together from different parts of the early disk; each component has a different story to tell… a long, 4.6 billion year old story. I’m always excited when I look at a new meteorite. They’re all so different! I’m not completely sure why, but I really enjoy working in the lab. I’ve worked in various labs since my first year in high school and throughout college! I enjoy using different techniques (microscopes, mass spectrometers, and synchrotrons) to study meteorites and putting all of that data together to paint a more detailed picture of the solar system’s formation. 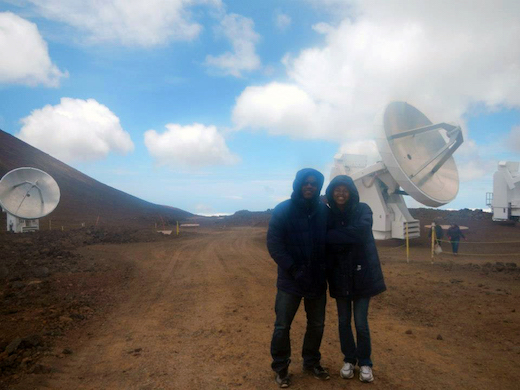 Telus and her husband Nathan standing in front of the Submillimeter Array radio telescope on Mauna Kea in Hawaii. DTM: What will you be doing at your next job? Telus: I will start a tenure-track faculty job in the Earth and Planetary Science Department at the University of California Santa Cruz! In addition to teaching and mentoring students, I will build a cosmochemistry research group there. My research there will build on the work I did for my Ph.D., where I worked on short-lived radionuclides, the main tools in cosmochemistry for constraining the timescales of processes governing the formation and evolution of the protoplanetary disk. Much remains to be understood about the source, abundance, and distribution of short-lived radionuclides in the early solar system, so I want to continue doing research in this area. I will also continue collaborating with Conel and other researchers at Carnegie on the work I’m doing now at DTM regarding water-rock interactions on early planetesimals. 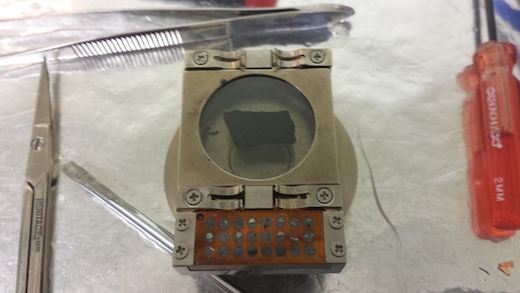 In the long run, I also want to study samples returned from space missions, such as OSIRIS-REx and Hyabusa 2, and build collaborations with astronomers, experimentalists, and numerical modelers to better understand chondrite formation and evolution. Telus giving a talk at James Madison University. DTM: Any other interesting anecdotes about your career you want to share? Telus: I loved school as a kid. When adults asked me what I wanted to be when I grew up, I used to always joke about how I wasn’t sure and that I would just stay in school forever. I didn’t realize that such a possibility existed through research and academia. I’ve been in school ever since!